One of the most powerful features of the control panel is that it gives you an easy way to paste HTML code. This opens up the opportunity for you to use various plugins and widgets. YouTube has a "Share" feature that allows you to display a YouTube video on your website. 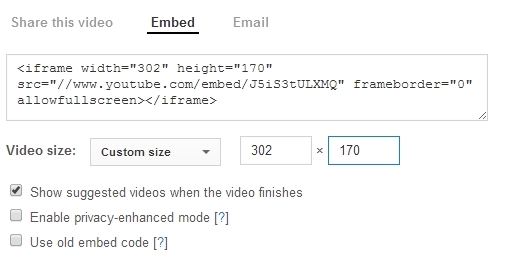 YouTube gives you "EMBED" code to paste on your page. Take a look at the header, and you will see a cool Game of Thrones video previewing season 4. It was an awesome season. Unfortunately season 4 already concluded and I'm waiting for season 5 in the spring. Sorry, I digress. Too many hours of programming. The point is that you too can embed YouTube videos on your header. 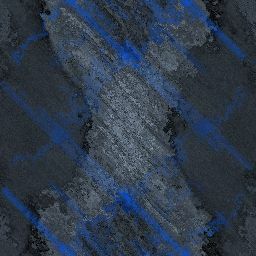 On most of the SiteRightNow.com pages, I display a puzzle slide show effect created on picturetrail.com. You too can display cool slide shows on your header! You can also display them on other areas of your pages using the same methods I describe here. Just paste the code into the text boxes on your work on content screens. First go to YouTube.com and find the video you want to use. Then you will see a box like the one in the picture above. I use the CUSTOM SIZE choice. Type in the height of your header in the second box, such as 170 in my case. This will automatically calculate the proper width. Copy the code shown in the box with your mouse. To do this, select all of the code with your mouse to highlight it. Then on Windows you can right click and choose COPY or hit the keys CTRL C. On a Mac you can hold down CTRL and click and choose COPY or hit the keys COMMAND C.
Then open your header on the SiteRightNow control panel, and click into either the MIDDLE text box or the RIGHT text box or the FOOTER box (if you want it to appear in your footer!). Then use your browser's paste command to paste the code in the box. On Windows you can right click and choose PASTE or use the keyboard combination CTRL V. On a Mac you can hold down CTRL and click and choose PASTE or use the keyboard combination COMMAND V.
That's all there is to it! When you save your changes, the video will appear! You can use a similar procedure for other widget code. I used a photo effect from picturetrail.com for the main SiteRightNow.com header, and I pasted the picturetrail.com code in my middle text box. Note that if you want something different to appear on certain pages like I did here (perhaps you want to show different videos in the header on different pages), use the special OPTIONAL MIDDLE box which is a blue color.